On September 16th I posted on the fascinating relationship between Elder Paisios and Saint Euphemia. Since then I have acquired more details on this relationship and further evidence of the great love Elder Paisios came to have for this Great Martyr of the Church. The Elder (Paisios) was in the front yard of his hut when he was visited by one of his spiritual children. He was repeating, from the heart, "Glory to You, O God", over and over again. "Can someone be rendered useless - in a good sense?" the Elder suddenly asked him. "Who would that be, Elder?" "Well, I was sitting in my cell quietly, then she came here and drove me crazy with excitement. They are having such a good time 'up there'." "I will tell you, but don't you tell anyone." 'Through the prayers of our Holy Fathers' (the traditional monastic manner of requesting permission to enter another's quarters). 'Euphemia', replied the voice again. I thought it over and decided to not open the door. At the third knock, the door opened on its own, even though it was bolted from the inside. I heard footsteps outside, in the corridor. I dashed out of my cell and saw a woman who was wearing a head veil. She was accompanied by someone who resembled Luke the Evangelist, but he vanished. Despite my certainty that this was not a sinister phenomenon because the woman's presence glowed with a radiant light, I asked her who she was. 'The martyr Euphemia',* she replied. I went into the chapel, prostrating myself and saying 'In the name of the Father...' She repeated it, also prostrating herself. 'And of the Son...', she repeated in a soft voice. 'Louder, so I can hear you', I said to her, and she repeated it, in a louder voice. 'Now, let me prostrate myself before you.' I prostrated myself and kissed her feet and then the tip of her nose. I thought it too impertinent to kiss her face. The Saint sat down on a stool and I sat myself down on the small chest, and she proceeded to give me the solution to my concern (regarding the ecclesiastical matter). Then she told me about her life. I knew that a Saint Euphemia existed, but I didn't know anything about her life. When she described her martyrdoms, I didn't only hear them being described; it was as though I could actually see them and feel them. I shuddered...oh my God!! 'How did you survive such tortures?' I asked. Well, after that occurrence, I was unable to do anything for three whole days. I was beside myself with elation and was constantly praising God. I didn't want to eat, I didn't want anything. I was constantly glorifying! 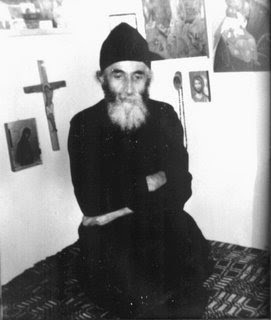 Elder Paisios in his cell with the icon he commissioned of St. Euphemia hanging on the wall beside him. "In all my life, I will never be able to repay my huge obligation to Saint Euphemia, who, although entirely unknown to me, and without being obliged to, bestowed on me such a great honour...."
When describing the incident, he added very humbly that Saint Euphemia appeared before him, "not because I was deserving, but only because I was preoccupied at the time with an issue that had to do with the state of the Church in general, and for two other reasons." What had especially impressed the Elder was "how that petite, frail person could last through such tortures.... If she were more of a...(implying a woman of a bigger and stronger physique), but she was so tiny...."
"With what complimentary songs can we praise Euphemia, who condescended from above and visited a wretched resident monk in Kapsala? On knocking the third time, the door opened miraculously and she, the Martyr of Christ, entered with heavenly glory, and we worshipped together the Holy Trinity." 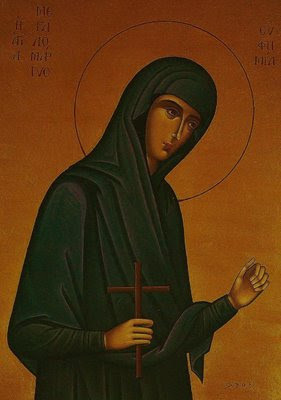 "Glorious Great Martyr of Christ, Euphemia, I love you very very much, after the Most Holy Mother...."
Contrary to his custom, the Elder left (Kapsala) for the town of Souroti and made the sisters of the monastery there participants of that celestial joy. With his help and his instructions, they painted an icon of the Saint exactly as she had appeared before him (depicted above). The Elder himself had fashioned a negative of the Saint's icon onto a metal mold, which he used to print small, stamped icons that he distributed as blessings to visitors, in honor of Saint Euphemia. While sculpting the mold of the icon, he had trouble fashioning the fingers of her left hand. He said: "I struggled to fashion her hand, but then I put forward a positive thought to explain it: 'Perhaps it is because I had also oppressed the poor girl...."
* During the Fourth Holy and Ecumenical Synod, which was convened in Chalcedon by the pious emperors Marcian and Pulcheria in the grand basilica of Saint Euphemia, the 630 Fathers undertook the retraction of the heretical views of Archimandrite Eutychius, who was supported by Archbishop Dioscorus of Alexandria. To resolve the dispute through a divine decision, the Patriarch - Saint Anatolius - proposed to both sides to compose a tome containing their respective Confession of Faith, and both documents would then be placed inside the reliquary of Saint Euphemia. The two parchments, on which were inscribed the definitions of the Faith with regard to the Person of Christ, were placed on the Saint's chest and after the reliquary was sealed shut, the Fathers began to pray. After eight days, they all went to the witnessing place, where, upon opening the reliquary, they discovered to their amazement that the Saint was hugging the Orthodox tome in her arms, as though she wanted to place it inside her heart, whereas the tome of the heretics appeared to have been thrown down to her feet. In the face of such a splendid proof of the truth, the Orthodox offered up thanks to God, and the heretics were scorned and jeered by the crowd of faithful. Other miracles have been mentioned, which the precious relics of Saint Euphemia have performed. During a Persian invasion, the barbarians stormed Chalcedon and attempted to destroy her relics with fire. However, they remained intact and furthermore, blood was seen pouring out of the hole that was made to open the reliquary. This miracle repeated itself occasionally at later times and would heal the faithful who came to collect some of the blood of Saint Euphemia. However, her tomb would more frequently exude a fragrant aroma, thus witnessing the favor that God had bestowed on the Saint. To protect them from another vandalization, the precious relics were translated to Constantinople where they were deposited in the Church of Saint Euphemia, near the Hippodrome. During the years of Iconoclastic persecutions by Constantine V Kopronymos, her temple was turned into an arsenal, while her precious relics were thrown into the sea and were washed ashore on the coast of Limnos Island, where they were salvaged by two fishermen. They were rediscovered during the reign of the Empress Irene and were transferred officially to the Capital (Constantinople) in 796, where they continued to work miracles. After many other adventures, the relics are now venerated in the Church of Saint George at the Ecumenical Patriarchate in the Phanar. From The New Book of Saints of the Orthodox Church (July Volume), Indictus Publications, p. 112.